At Wharf Gate (AWG) prices for logs delivered to ports around New Zealand decreased on average 7 NZD per JASm3 in April. 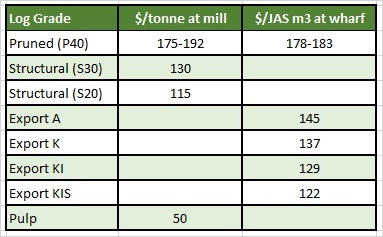 This decrease in AWG prices is due to a combination of increased shipping costs and uncertainty in the China log market. While the demand for logs is at record levels, there is an imbalance between log and domestic wholesale prices. There are log vessels enroute to China from New Zealand without confirmed Letters of Credit (LCs) and Chinese log buyers are using this opportunity to try and negotiate log prices down. The domestic market for logs has continued the very stable start to 2019. On average mills report sawn timber sales up about 5% on last year. Increases in consents for new dwellings continue to be dominated by the North Island cities, with consent numbers in the South Island down on this time last year. Due to the drop in the AWG log prices the PF Olsen Log Price Index for April decreased $3 to $131. The index is currently $2 above the two-year average, $5 above the three-year average, and $13 higher than the five-year average. Prices for domestic log sales in April as the start of quarter 2 are mostly unchanged from quarter 1. Prices for pruned logs have remained flat despite decreases in export prices with supply and demand well balanced in most regions. Some mills in the CNI have reported an oversupply of pruned logs. There has been some modest increases in structural log prices in some regions. For the year end February 2019, consents for new dwellings rose to levels last seen in 2004. As seen in the graph below there has been a relatively steady increase in consents for new dwellings since 2011. In the year end February 2019 there was a 7.8% increase on the year end February 2018. This increase was driven by development in North Island cities with Auckland up 25% and Wellington up 14%. The Waikato region increased 11% while the rest of the North Island was down 3.4%. Conversely Christchurch was down 2.0% and the rest of the South Island was down 5.9%. Mills report on average about a 5% increase in sales of non-clear sawntimber compared to last year. Domestic sales of clear sawntimber are similar to last year. The Australian market is reported as tough with demand off the boil. The weakening of the NZD against the AUD means NZ mills can lower price if required to remain competitive and still retain margin. There is a lot of sawn timber inventory in China. In Taicang for instance there is 1.7 million m3 of Canadian SPF (spruce, pine, fir) as well as the usual other species from other countries. The price of Canadian SPF has fallen more than 30 USD in the past three months. 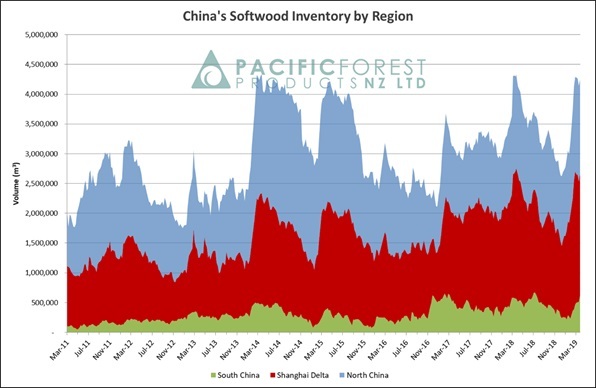 NZ mills indicate they are targeting a slight increase in price for radiata sawn timber in the China market. The European clearwood market remains strong. Total softwood log stocks across China are now around 4.2-4.3 million m3. Daily uplift from the ports is currently at a record 90,000 m3 per day. The softwood log stocks have remained high since the Lunar New Year holidays. The previously mentioned 1.7 million m3 of Canadian SPF sawn timber equates to 2.5 million m3 of logs. Over recent months exporters of New Zealand radiata logs to China have achieved small but consistent increases in the CFR prices for logs while the domestic wholesale prices have remained flat. The price of other species from other countries has softened to reflect this market situation. Many log buyers are not happy with this situation and want to reduce the price of radiata logs from New Zealand. The volume of logs imported from New Zealand are by far the largest, as well as the most consistent and stable so the China log market is reliant upon this volume. Some exporters consider the present situation as a price correction, while others are pointing to more fundamental changes to the log market. There is some substitution of radiata with lower value species and in the inland ports there are increasingly cheaper logs imported from countries who co-operate with China through the One Belt One Road initiative. It is hard to accept there are fundamental changes such as some exporters forecasting softening construction, with the current daily record off-take of softwood logs from the ports. What is of note is there is a range of CFR prices achieved by log exporters (assuming all log sale contracts get converted to Letters of Credit) meaning AWG prices offered in May will either increase in range between exporters, or some exporters will suffer losses to maintain supply. When issuing April AWG prices, most exporters seemed to wait and see what other exporters were offering before settling on their offers. This was because many of their sale prices were unconfirmed. The business sentiment in India is focussed on general elections and the formation of a new government in May 2019. Kandla: While the log market is on the verge of being in short supply with low log inventory and low ‘in transit’ volume from New Zealand, the overall demand market is not as strong. Many regular buyers of logs from New Zealand are now also buying some kiln dried sawn lumber from Europe, SYP from the USA, and pine logs in containers from South Africa. This allows them to buy smaller lots more regularly that improves cash flow and upfront finance costs of LCs and GST. The marketing of Canadian sawntimber is increasingly becoming aggressive in India and potentially may become a significant trade flow into India. The LC situation is largely slow and constrained. The positive news is that some of the Indian banks like UCO Bank and Oriental Bank of Commerce have restarted offering better credit limits and LC limits. Some of the large New Zealand log exporters have been active in collecting up to 2 USD per JASm3 for late opening of LCs by their buyers and this has created strain and discomfort in relationships. 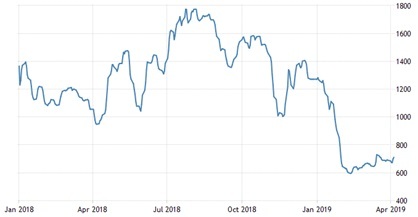 The sawn timber prices from New Zealand radiata has stayed at Rs491/CFT mainly due to the appreciation of the Indian Rupee which is now at Rs 68.50 against the USD. While the log buyers may actually be able to absorb a CFR price increase for NZ Logs, any price increase is unlikely given the price reductions in the China log market, as the Kandla log trade closely follows the price trends of China. We expect some of the large NZ exporters will put some extra volume in Kandla in the next 6-8 weeks and then market tapering down from May largely following China trends. The current CFR market price is $153-155 USD for long A grade logs. Tuticorin : The production of sawn timber is still below capacity and most mills are holding more stock than Kandla (6-8 weeks). Market commentators expect one to two log shipments from New Zealand from late April/early May but repeat orders will be after a gap of two months. The log buyers are generally talking about the New Zealand pine logs market share reducing by about 20% due to Ukraine/Latvia/Scandinavia/Austria/Russia supplies becoming more easily available at viable prices. 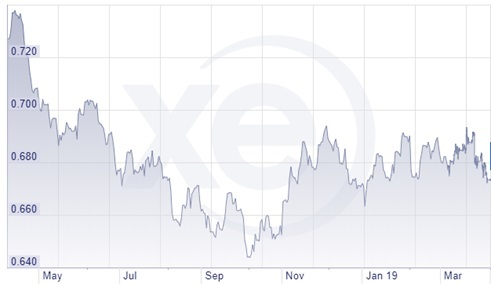 The NZD strengthened against the USD in the first three weeks of March but depreciated in the last couple of weeks to be lower than early March levels. 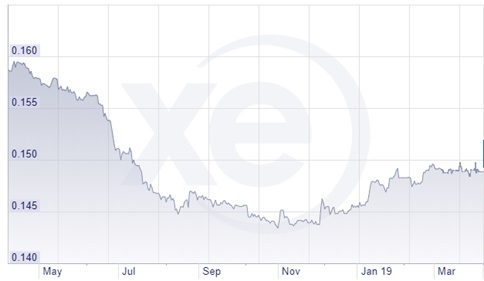 The Chinese Yuan (CNY) was stable against the USD through March. 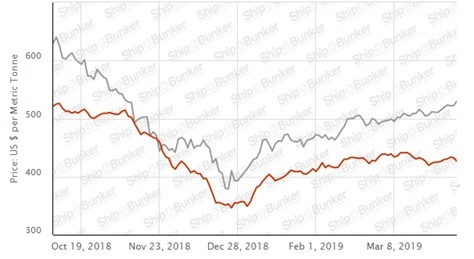 As reported in Wood Matters last month the ocean freight costs have bottomed out and the average cost to ship logs to China has increased from mid to high 20’s USD per JASm3. Freight rates still remain below last year’s average. The Baltic Dry Index (BDI) is a composite of three sub-indices, each covering a different carrier size: Capesize (40%), Panamax (30%), and Supramax (30%). It displays an index of the daily USD hire rates across 20 ocean shipping routes. Whilst most of the NZ log trade is shipped in handy size vessels, this segment is strongly influenced by the BDI. The graph of the BDI over the last year below shows the recent bottoming-out then increase in the BDI. 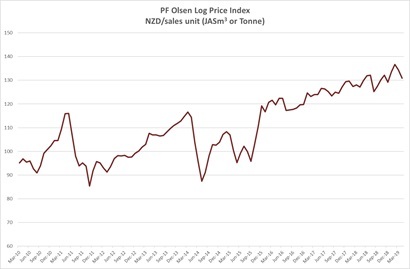 Due to the drop in the AWG sale prices for export sawlogs the PF Olsen Log Price Index for April decreased $3 to $131. The index is currently $2 above the two-year average, $5 above the three-year average, and $13 higher than the five-year average.